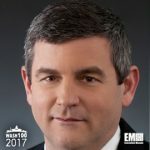 Executive Mosaic is glad to announce Huntington Ingalls Industries President and CEO Mike Petters as an inductee for the 2017 Wash100 — Executive Mosaic’s annual selection of the government contracting arena’s most influential voices. Petters has led the business since his original 2008 appointment to what was then known as Northrop Grumman Shipbuilding and steered the organization through its 2011 spinoff from former parent Northrop Grumman to become the company now operating as Huntington Ingalls. Newport News, Va.-based Huntington Ingalls is the U.S. military’s largest shipbuilder and in 2016 took the next step on its “Path to 2020” strategy focused on growth in government services through the $380 million purchase of Camber Corp. in December to add new technology-related contract work and diversify its revenue mix. Upon the deal’s closure, Huntington Ingalls launched a standalone $1 billion government services segment named HII Technical Solutions that comprises Camber along with six other subsidiaries that gives the parent company an added footprint with intelligence, military and civilian agencies. “We now have the scale to focus on that business in a way that allows for the pace to keep up with what is required in services. We think it’s a reasonable approach to expand our customer set and create access for capabilities on the high-end of services in a way that makes sense for us,” Petters told investors in November. In that November call with analysts, Petters highlighted government services as Huntington Ingalls’ main target area for growth to complement the “basically flat business” of its core ship construction work. “We continue to about that today, although there may be some opportunities ahead of us. But now we have access to a little more of the normal natural growth progression in the government services field,” Petters added. Huntington Ingalls expects HII Technical Solutions to record low-single digit sales growth in 2017 and progress to 5-7 percent expansion by 2020. HII reported $7.1 billion in revenue for 2016, up nearly 1 percent from the prior year.